The Supreme Court bench of the Chief Justice J.S.Khehar and Justice D.Y.Chandrachud, on Friday, stayed the Himachal Pradesh High Court’s July 29, 2016 judgment directing the Centre to enact law prohibiting slaughtering of cow/calf, import or export of cow/calf, selling of beef or beef products, at the national level. As the High Court, in the same judgment, directed construction of cow shelters in the state, the Supreme Court allowed the state government to file the Special Leave Petition against the judgment. The court also issued notice to the respondents, Bharatiya Govansh Rakshan Sanverdhan Parishad, Himachal Pradesh and others. The Himachal Pradesh High Court bench of Justices Rajiv Sharma and Sureshwar Thakur, had held that paucity of funds should not come in the way of construction of gausadans/gaushallas/shelters throughout the State. “It is the constitutional duty of the State to protect the cattle wealth by augmenting its financial capacity”, the bench had held. The High Court bench had directed the State Government to ensure the construction of gausadans at 38 urban areas within six months. The bench had also directed the Centre to provide sufficient funds to the State for the purpose. Estimating the number of stray cattle in the state to be 32,100, the High Court held that construction of cow-shelters is imperative, to avoid destruction of crops and obstruction of smooth flow of traffic. The State Government has not taken necessary steps for the removal of stray cattle from the National Highway which is resulting in injuries to the hapless animals, and to the commuters, the High Court noted. The High Court, in the same judgment, had also issued a number of other directions to ensure minimum support price for the farm products. But it is the High Court’s directive to enact a law against cow slaughter within six months that has become controversial. 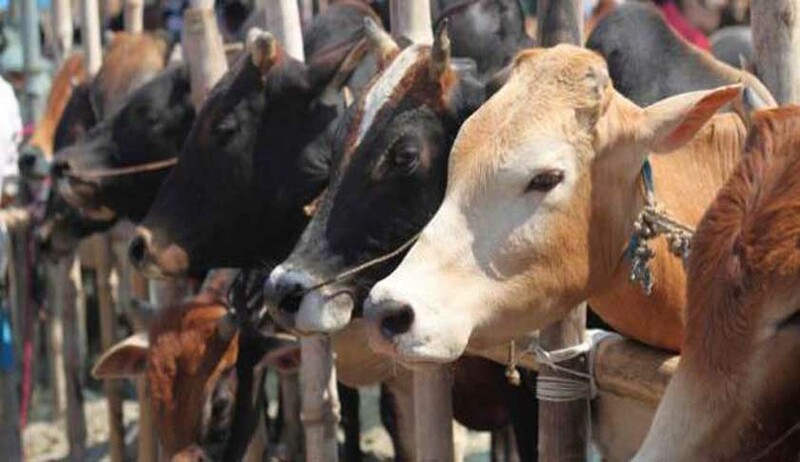 The High Court had first suggested to the Centre to enact the law prohibiting slaughtering of cow/calf, import of export of cow/calf, selling of beef or beef products, at national level within three months. The Centre had taken the stand before the High Court that the subject falls within entry 15 of the State List, and that only five States and one Union Territory have no legislation on the subject. The High Court, however, observed that the Centre did not take into consideration entry 17 and 17B of the Concurrent List. Therefore, the High Court reiterated its earlier order dated 14.10.15 in which it directed the Centre, to enact a law for the purpose. On July 29, 2016, the High Court directed the Centre to take necessary steps within six months.